Generally we will draw pictures on paper using pencil or pen. Similarly some one has drawn a picture on the surface of Earth. The picture is 4.2 kilometers longer. We cannot see this picture directly by standing beside it. It can be seen clearly only from the flight or helicopter. The shape of the picture can be understood clearly only from the helicopter or flight after going to an altitude of 3000 feet from the Earth and seeing it from there. The picture is called as Marree man. It looks as if a tribal person is hunting birds. The picture was drawn on vast plateau near Marree village in Australia. That’s why it is named so. The existence of that picture became known to the world for the first time in June, 1998. A pilot while going over this region saw the picture accidentally. He took a snap of the picture and faxed it to a manager of nearby hotel. The next day, hotel manager told the news about the picture to the media and news reporters. Then the entire world came to know about the picture. Although the existence of the picture was discovered long back, its history has still remained a mystery. Till now, the details of who has drawn it and why it was drawn were not yet discovered. The picture might be drawn by digging the ground with the tractor or plough. But when archaeologists went there for observing it for the first time, they did not notice any foot prints or tyre prints. This was another wonder about the picture. Lines in the picture were dug to a depth of 20 to 30 centimeters into the ground. Lines were drawn with a width of 35 meters. Perimeter of the picture is 28 kilometers. It is not possible for a single person to draw this much big picture. Some group of people might have drawn it using big devices. But no one in the surroundings has observed such happening. Moreover although it is such a big picture, it was drawn perfectly with accurate measurements and sizes of body parts. Not even small errors were there. Also there is an argument that it cannot be drawn without the help of Global Positioning System (GPS). An American flag was obtained in a pit near the picture. So there is a doubt that Americans might have drawn the picture. But still it is a mystery about who has drawn it and why they have drawn it and why they have not revealed their name. 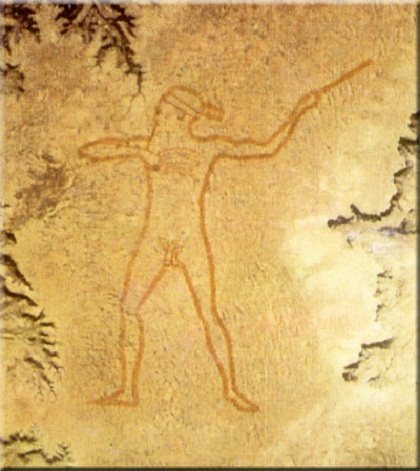 Some believe that the picture was drawn by the famous artist Goldberg of South Australia. But he had died five years ago. So the truth was not yet revealed to the world. Still the history of picture has remained a mystery. « Names of Calendar months	» Why accused people are covered the face with mask?